Cynthia Scott writes, “The ‘hotel’ on my block has now graduated to an events rental venue. Last week, for 3 or 4 days running, the space was rented to someone from Tales of the Cocktail for a daily party from early afternoon to 7 pm each day, with a DJ blasting extremely loud hip hop and other music and a constant stream of people being ferried from the CBD to the location via Uber. A week or two earlier the space was rented for the day to a HUUUUUGE (to paraphrase a certain candidate) birthday party which drew people from all over the city, with cars racing up and down our one-way street and parking in people’s driveways. 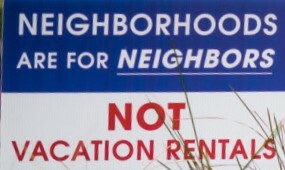 They departed by sundown, so neither of these rentals could be considered a “home rental” by any definition. I am submitting these comments in connection with the City Planning Commission’s reconsideration of the issue of Short-Term Rentals (STRs) in Orleans Parish, and the City Council’s directive that a proposed zoning ordinance be drafted. 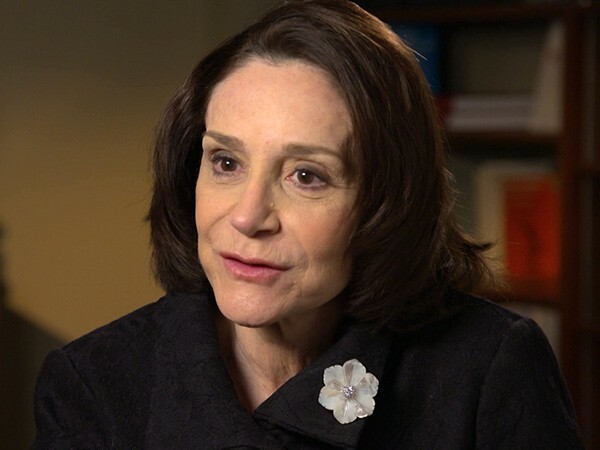 As a point of background, I am the retired Chief Economist of the Mortgage Bankers Association in Washington and spent years running a research group dedicated to housing and housing finance issues. I have appeared on all of the major network and cable news shows, and have been quoted in newspapers through the US and other countries. 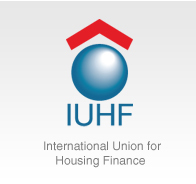 Even though I retired and moved back to New Orleans two years ago, I am still the US representative on the executive committee of the International Union of Housing Finance, a 100-year old organization dedicated to housing issues around the world. 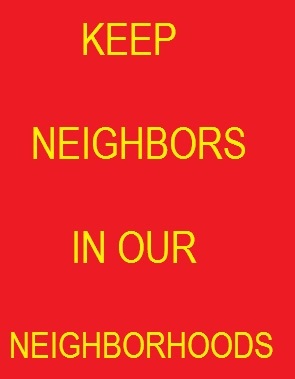 Based on my background, I cannot think of an action that would be more destructive to the fabric of our neighborhoods and the well-being of our homeowners than the legalization of STRs for the benefit of a few, thereby rewarding those who take advantage of a lack of enforcement to violate existing laws with impunity. In Part One of my comments, I will make three basic points about the negative economic effects on homeowners. In Part Two I will address comments that have been made to the effect that AirBNB, VRBO, and similar operations are like Uber and are merely part of the growth of the so-called sharing economy. 1) STRs fundamentally upset residential valuations by introducing unsustainable commercial valuations into residential neighborhoods. 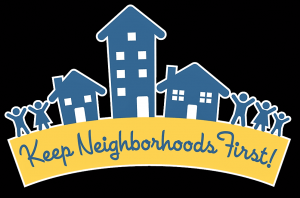 We have already seen home prices in historically significant neighborhoods increase at rates far in excess of the local incomes needed to support those prices. A significant portion of those home price increases are due to ability of some of the properties to earn upwards of 20 percent to 25 percent return on investment through illegal renting. This is great news if you already own a home in one of these areas and will be selling soon. Because the Assessor’s Office has no way to separate out house sales for STR usage, this is great news if you are the city collecting residential property taxes based on values inflated by STR commercial use. It is bad news if you are trying to buy or rent in Mid-City, Treme, the Bywater, or other impacted neighborhoods in order to live in the city. It is terrible news if you are a long-term resident with no intention of moving, but are now faced with an annual property bill driven up by the valuation effects of illegal renting. The valuation and property tax problem will likely be exacerbated by the idea that the city can mitigate the negative impact of STRs by limiting the number allowed per block face. The owner of the first one on the block makes a killing, and the value of that property goes up. However, the other owners on the block not only have to deal with the disruptions caused by the STRs and the higher property taxes, they are precluded from selling at the higher STR-driven prices because no other STRs will be allowed on their block (assuming for the sake of argument that the city would actively enforce density limitations). Therefore, the idea that the negative impacts of STRs can somehow be ameliorated by reducing the permitted densities can actually make more people worse off from a valuation perspective. Given the instability of this structure and the lack of equitable treatment in terms of valuation and who is allowed an STR and who is not, I do not believe density limits would survive legal or political challenges, and are therefore not a viable option to prohibition. The result is that if you are a New Orleans resident with no intention of selling and moving, you would not only face the prospect of having weekly fraternity parties next door, you get to pay higher property taxes for the privilege. The result is that if you are looking to buy, you risk over-paying and being underwater on your mortgage if something were to happen suddenly to impact negatively the STR business, as will be covered in the next point. 2) Short-term Rentals directly inject the business risk of tourism into residential neighborhoods. Hotel owners and operators are accustomed to the business risks associated with the travel and hospitality industry. These risks are reflected in their operational plans, capital investments, and equity and debt financing costs. They understand that in a recession, travel is disproportionately impacted as businesses cut back on discretionary travel as a first response. They learned in the aftermath of the 9/11 attacks that terrorism can interrupt air travel, and that even when flights are restored, companies will impose travel restrictions on key personnel. In contrast, the health of the hospitality industry has a more muted impact on the traditional residential housing market in New Orleans. 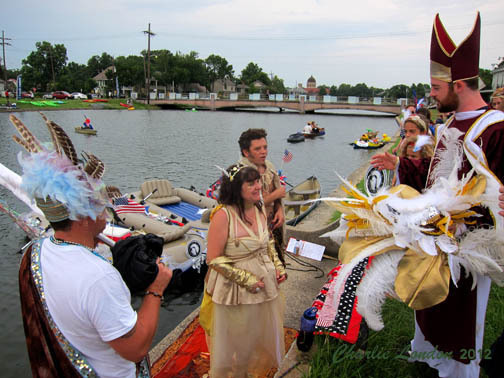 Tourism is only one of the legs of the New Orleans economy, and there are other legs to support the New Orleans jobs market and home prices. STRs, however, directly inject the risk of the tourism market into every neighborhood of the city where they exist. Demand for houses and high prices exist when owners can earn high returns, but what happens in a downturn? 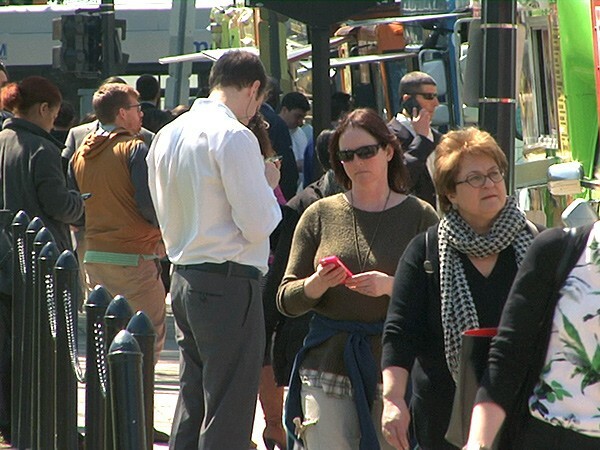 What happens when tourism suddenly slows for one of any number of predictable and unpredictable reasons? What happens is what we have seen in other housing markets dominated by investors and speculators. At the first sign of a reversal, they sell with a vengeance, driving down prices and leaving the long-term residents suffering the consequences of rapidly falling prices and “For Sale” signs everywhere. If the properties are leveraged, they can sit for months and years as they work their way through the mortgage foreclosure (and probably bankruptcy) process, further depressing values. Real estate speculation is a fact of life. Some people win and some people lose. When a strip mall goes bankrupt on Airline Highway, the negative consequences (other than to the property’s owners and lenders) are limited to having one more eyesore around town. When that speculation, however, is driven by STRs and is occurring in some of the city’s most important and historic residential neighborhoods, the negative consequences of a drop in tourism will go right to the hearts of these neighborhoods, and will be much more severe and widespread than any normal downturn. 3) Weekly bachelor parties are more than a nuisance. They represent a real loss of value for the neighbors. The logical outcome is that once an STR opens on a block, the only informed sales that would not be negatively impacted by the existence of the STR would be those to another STR operator. As already noted, however, such a sale would be prohibited if density limitations were put in place as part of an attempt to make STRs politically palatable. This points again to the utter fallacy of putting any faith in density limitations. The idea that the CPC and the City Council would not be inundated with requests for exceptions, and that many of those requests would be granted, simply ignores political reality. That assumes, of course that the many illegal operators of STRs would even apply for exemptions to the density limits. The reality is that the city has failed for years to deal with illegal STRs. Based on this history, it is reasonable to expect that any density limits would be ignored or gutted in a few years. 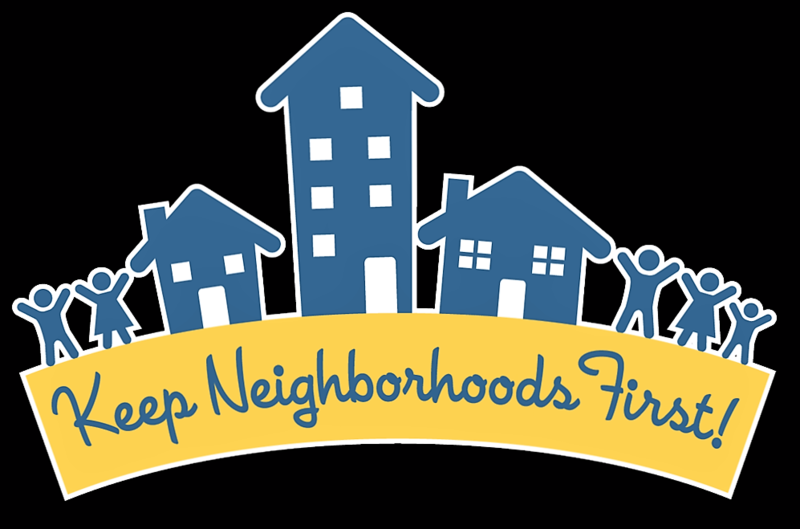 In conclusion, the adoption of a legal STR framework for residential neighborhoods, particularly for non-owner occupied structures, would have tremendous and largely irreversible negative impacts on the fundamental character of the city for years to come. Ignoring the quality of life issues, the economics alone will lead to a further hollowing out of the city’s full-time residents. Homeowners will see that the rational action is to sell. They would avoid both the higher property taxes and the risk of a speculative bubble bursting with downturn in the tourism industry. It has often been argued that AirBNB and similar operations are nothing more than Uber for houses, that they are simply one part of an irreversible movement toward a shared economy where technology brings together the buyers and sellers of various services. At their best, such arguments are facile and do not stand up to even a modest amount of economic scrutiny. At their worst, they are a bald-faced attempt to direct attention away from what is illegal activity by saying that it is no different from what everyone else is doing in other areas of the economy. 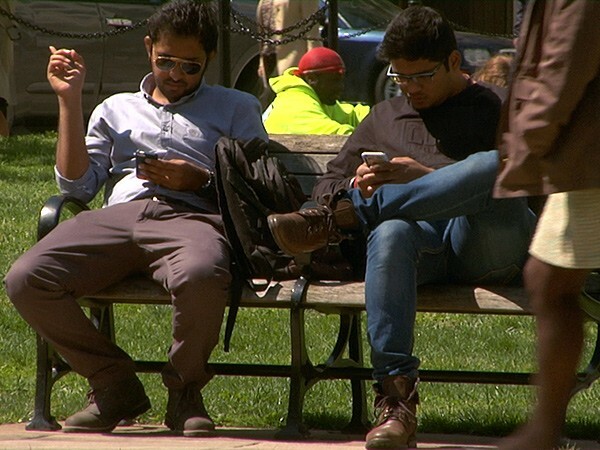 In reality, the only similarity between Uber and AirBNB is that both rely heavily on computers and smart phones. Uber is an example of what the Austrian-American economist Joseph Schumpeter described as “creative destruction”. The idea is that in a capitalist system, economic growth occurs when innovators put their money behind new ideas for goods and services. While the creative process is the key for creating new markets and new opportunities, it comes at the cost of destroying old products and services, and the capital invested in delivering those old goods and services. A prime example is Blockbuster versus Netflix. Blockbuster invested huge sums in brick and mortar stores and an inventory of video tapes, and later DVDs, to fill the shelves in those stores. It had a large complement of employees to man the cash registers and stock those shelves. Along came Netflix with the idea that people could go to their computers, select what titles they wanted to see, and have the DVDs delivered a few days later by the postal carrier. Immediately successful, the service Netflix created began the destruction of the hundreds of millions of dollars Blockbuster had invested in its system. Later, when Netflix switched to streaming content, it effectively destroyed the capital Netflix itself had invested in DVDs and its mail order business. In Uber’s case, it challenged the existing way of summoning a taxi, as well as introducing a model that matched supply and pricing to peak periods of demand. Uber was challenging the economic model of the taxi business, but, more importantly, it challenged the local regulatory framework for taxis that existed in each of the cities where it sought to operate. Its success has come in exposing and differentiating between those regulations that were necessary for the public’s protection and those regulations that merely existed to protect the status quo. After all, until Uber, the method of summoning a cab outside a hotel had not really changed since the 1800s. This is Schumpeter’s creative destruction process at work. The key difference between Uber and AirBNB (and similar companies) is that there is nothing fundamentally illegal about the service Uber provides. Paying someone to take you in his or her car from Point A to Point B is not inherently illegal, provided appropriate licensing requirements are met. The only ones harmed by the Uber innovation are those invested in the old ways of doing business. In contrast, AirBNB and similar services are providing technology platforms that offer services that are fundamentally illegal. The regulations of which AirBNB facilitates the violation are not there to protect capital invested in the hotel industry. Rather AirBNB is facilitating, for a profit, the violation of zoning laws that were enacted to protect individual homeowners from this type of commercial activity. If the only harm was to the established hotels and legal bed and breakfast establishments, it could be argued that AirBNB is just another example of Schumpeter’s creative destruction. 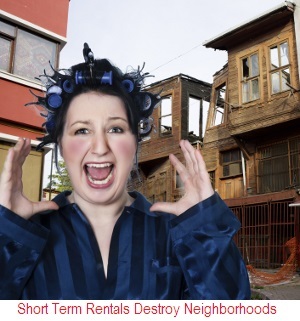 However, the true harm and destruction is to the residents of the neighborhoods disrupted by the illegal short-term rentals. The residents of these neighborhoods do not have capital at risk in the hospitality industry like Marriott or Hilton. Rather the capital they have at risk is in homes that they trusted would be protected by zoning laws and the enforcement powers of the city government. It appears that trust was misplaced. Therefore, AirBNB has nothing to do with Uber or Schumpeter’s growth through creative destruction, but is simply a case of making a fast buck at the expense of someone else by facilitating an illegal activity. The closest parallel to AirBNB is not Uber, but hiring prostitutes with Craig’s list. 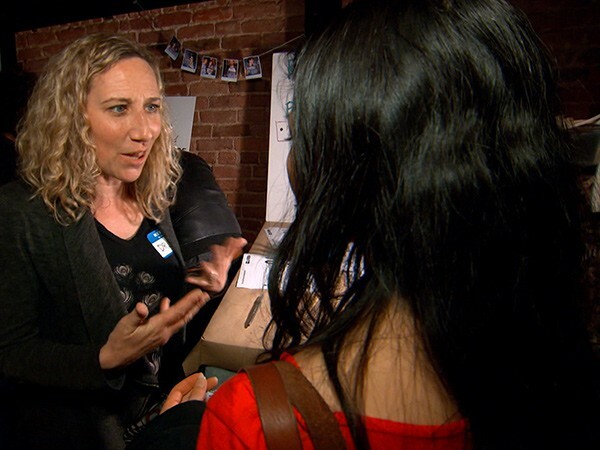 This open letter is not about Air…BnB as such, but about the challenge of supporting your industry and community amidst new paradigms of travel and tourism. When Tales of the Cocktail was founded, we deliberately placed the event in July, one of the most difficult months for our local economy, in an effort to help increase revenue for New Orleans’ many hospitality businesses and employees. The hotels, bars, restaurants and thousands of hospitality workers they employ have been grateful for Tales of the Cocktail, and we want to continue to do right by them. In this spirit, we write to you today to help raise awareness about the effect short term rentals, such as AirBnB, are having on residents, business owners, and event producers, like ourselves. Bar manager at Erin Rose, and former CAP, Rhiannon Enlil was given a notice of eviction last week, after four years in her apartment because her landlord wants to list the property on AirBnB. This is by no means an isolated incident. 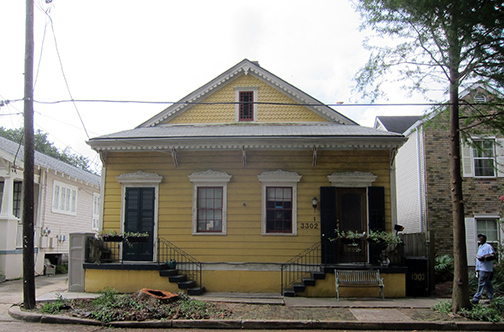 There are now over 4,316 AirBnBs operating in New Orleans. This issue is also having a significant impact on the hotels and licenses B&B’s in New Orleans. Hotels are one of the longest standing harbingers of hospitality. 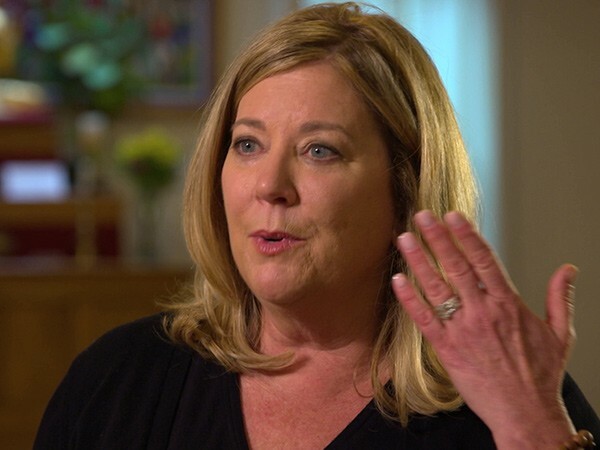 They employ hundreds to thousands of people, provide insight and infrastructure to guests, and work with event organizers to facilitate events that would otherwise not be possible, such as Tales of the Cocktail. Every tasting room and seminar we facilitate is done so in a hotel, and it’s hard to imagine where else we could possibly produce so many events within one week. Because of our longstanding relationships with these hotels, we’re able to negotiate special rates for Tales attendees year after year. Hotels are experienced in the practice of hospitality, and legally qualified to accommodate our guests, whereas short term rentals, which are illegal in New Orleans, fundamentally upset residential valuations by introducing unsustainable commercial valuations into residential neighborhoods. In this spirit, we encourage you to stay with one of our partnering hotels (or even another local hotel if you prefer), but please avoid staying at an AirBnB or other short term rental property that is not legally sanctioned to operate in New Orleans. Each short term rental takes revenue away from our own hospitality industry; if the hotels are operating below projected capacity, staff hours get cut, and employees get laid off. Tales of the Cocktail is one of many organizations in New Orleans working to have these illegal rentals addressed by our city government, but in the meantime, we encourage you to consider the matter for yourself. Everyone wants the best deal they can find, but sometimes the best deal results in an exceptionally rotten deal for everyone else. We employ you: help us keep locals in their homes and guests visiting our city in the many beautiful and hospitable hotels and B&Bs New Orleans has to offer. Thank you for your time and consideration. If you support this effort, please share this post. Thank you to our partnering hotels: Hotel Monteleone, Royal Sonesta Hotel New Orleans, Ace Hotel New Orleans, AC Hotel New Orleans Bourbon, Bienville House, Bourbon Orleans Hotel, Dauphine Orleans Hotel, Hotel Le Marais, Hotel Mazarin, MOXY NOLA, Omni Royal Orleans Hotel, The Ritz-Carlton, New Orleans, W New Orleans – French Quarter. TODAY, Tuesday, June 14, at 1:30 p.m., the City Planning Commission will propose a CZO amendment to allow all categories of short-term rentals, and make short-term rentals permitted and conditional uses in all neighborhoods. The CPC Staff Preliminary Report makes these and other recommendations, and has little information on enforcement mechanisms to control and penalize illegal operators. 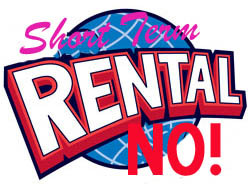 For information on today’s meeting and a link to the Preliminary Staff Report, please use the link, below – short-term rentals appear as agenda item 9. Call the CPC at (504) 658-7033 before you go to make sure the vote will take place today and that there will be time for public input. If you are able, please attend the 1:30 p.m. today, Tuesday, June 14 CPC meeting in City Council Chambers to voice your opinion. Thank you. 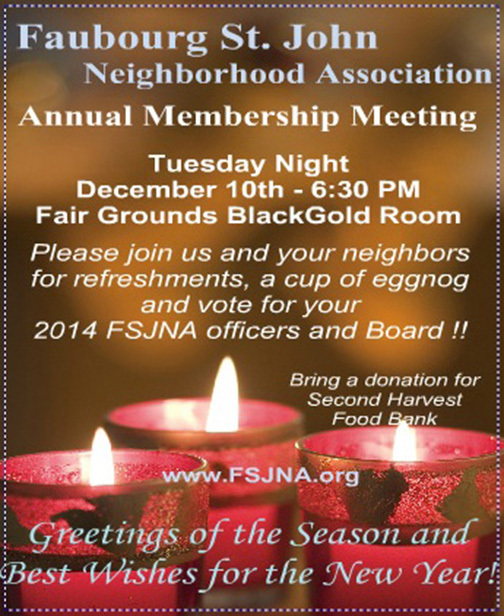 Neighbors are invited to attend the General Membership Meeting on Tuesday, December 10th at 6:30 p.m. The meeting will be held at the Fair Grounds Black Gold room. The Black Gold room is in the back on the left hand side. Egg Nog and Cookies will be served. This postcard courtesy the Linda Burns Collection. 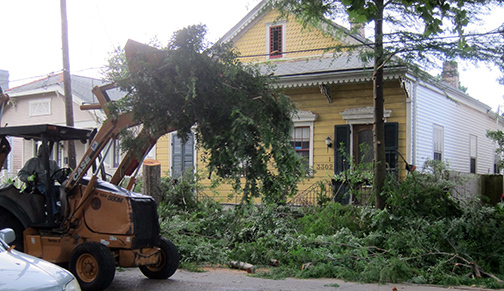 A neighbor in the 3200 block of Grand Route Saint John called the City of New Orleans about a dead tree in front of their home. The tree was dead and full of bees. 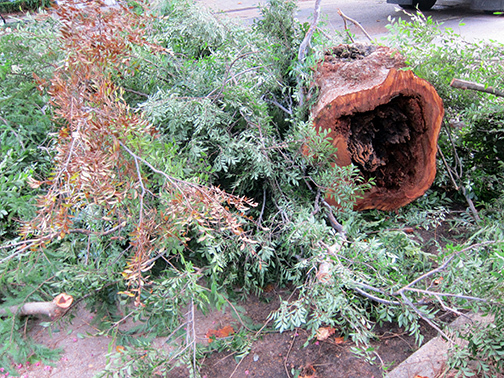 The City came out and determined that the tree needed to be removed. 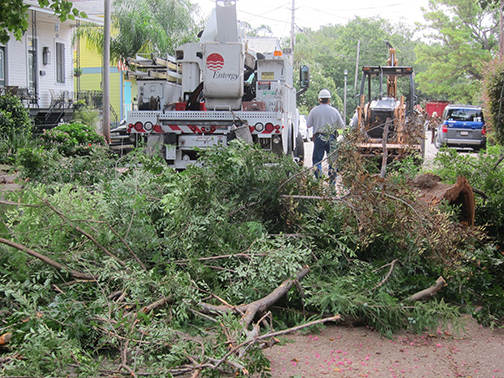 The Parks and Parkways Department will help with trees on City property. This tree was between the sidewalk and the street. The area between the sidewalk and the street belongs to the City of New Orleans. The Department of Parks and Parkways encourages tree planting by citizens, but requires citizens to get a free Tree Planting Permit to plant a tree between the sidewalk and curb. 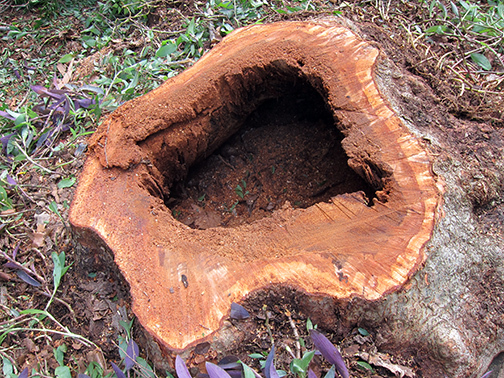 Citizens also need to submit plans for the trees and/or shrubs they intend to plant on public property. For full information and a permit application, see the Tree Planting Permit page from the City of New Orleans Permit & Licenses department. Depending on the location planting location, citizens may also need a Sidewalk Cut Permit. who did a great job! to make sure all the utilities were safe. City workers left the area clean.